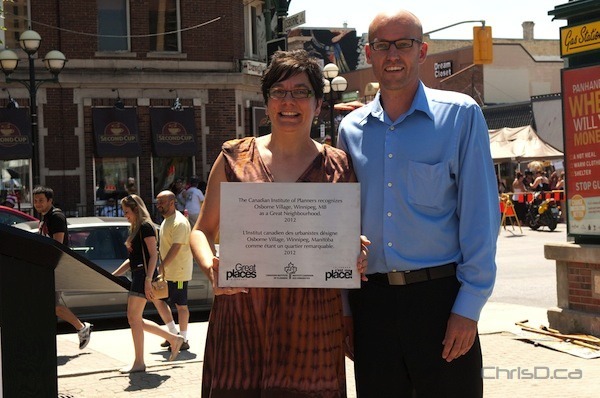 Osborne Village was honoured Sunday by the Canadian Institute of Planners as Canada’s Great Neighbourhood for 2012. The trendy Winnipeg neighbourhood won the distinction in April as based on popular vote and a CIP panel decision. Osborne was a finalist along with other destinations country-wide in the Great Places im Canada contest. Donovan Toews of the CIP presented a plaque during a ceremony at the Gas Station Theatre. Fort Rouge-East Fort Garry councillor Jenny Gerbasi accepted the plaque on behalf of the city. A permanent Osborne Village location for the plaque will be determined at a later date.